The NoZone® Ozone Scrubber operates by forcing room air through a bed of proprietary catalyst that converts ozone (O3) into oxygen (O2) and carbon dioxide (CO2). Any dust or other particles in the ozone depleted air that emerge from the catalyst cartridge is then removed by a HEPA filter before exiting the unit. Under normal atmospheric conditions of temperature, humidity and ozone, the catalyst used in the scrubber need not be regenerated or replaced during the lifetime of the unit. The NoZone Ozone Scrubber balances flow rate and ozone destruction efficiency to maintain ozone levels below 5 parts per billion (ppb) within a NoZone Enclosure or other similarly sealed volume of 20 cubic feet or less. It should be set up to operate externally to the enclosure with ozone depleted, filtered air being continuously pumped from the scrubber into one side of the space with an exit port opposite. The scrubber comes equipped with ducting and clamps to ensure a tight seal with the air flow vent on the enclosure. Ozone levels within the enclosure should be periodically checked with a sensitive (ppb) ozone monitor. 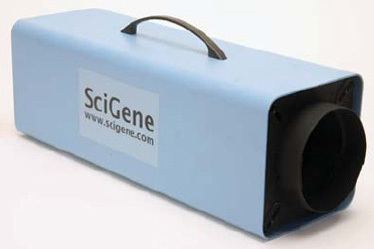 SciGene offers a high performance ozone analyzer for short-term rental (Cat. #1090-40-1) for this purpose. The NoZone Ozone Scrubber quickly achieves and maintains low (< 5 ppb) ozone levels within a NoZone Enclosure, even during periods of high (75 to 100 ppb) laboratory ozone. The ozone-safe environment created by the scrubber can be used for operating microarray processing and scanning equipment and for storing arrays.